The Cadillac Escalade Hybrid is a gasoline-electric version of Cadillac’s full size luxury sport utility vehicle. 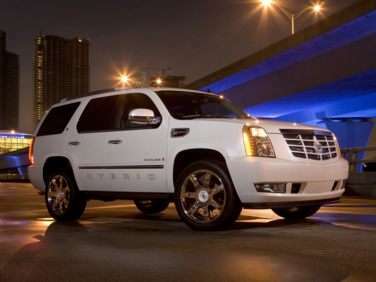 Cadillac’s parent company, General Motors, introduced the Escalade in 1999 to help fend off strong competition from German and and Japanese luxury brands, as well as to compete with Ford’s Lincoln Navigator, which had been brought to market the previous year. The Cadillac Escalade was put into production just ten months after the project was approved, and was identical to the GMC Denali sport utility vehicle. After being on the market for two years, the vehicle had a brief hiatus, and went back on sale with a 2002 model year facelift that gave the Escalade an appearance more appropriate for the Cadillac brand. The Cadillac Escalade is produced at a General Motors assembly facility in Arlington, Texas. Since the Escalade’s introduction, Cadillac has supplemented the Escalade lineup with the Escalade ESV, an extended wheelbase version based on the Chevy Suburban; the Escalade EXT, a luxury pickup truck based on the Chevy Avalanche; and the Escalade Hybrid. The Escalade Hybrid premiered at the South Florida International Auto Show in 2008, and went on sale later in 2008 as a 2009 model year vehicle. Production of the Cadillac Escalade Hybrid was discontinued after the 2013 model year, although the traditional gasoline Escalade is still being produced. The Cadillac Escalade Hybrid occupied a unique position in the market as the only luxury hybrid sport utility vehicle with enough seating for eight occupants (when the second-row chairs are swapped out in favor of the optional bench, that is). It was available in both rear-wheel-drive and all-wheel-drive configurations. The Escalade Hybrid uses a regenerative braking system that captures the vehicle’s kinetic energy and feeds it back to the electric motor to be stored or reused. A system called Active Fuel Management turns off half the engine’s eight cylinders when the engine is not under heavy load, in order to save gasoline. The 6-liter V8 gasoline engine, combined with two 60 kW electric motors and a battery pack, produces a total of 379 horsepower. The hybrid drivetrain is mated to what Cadillac calls a “two-mode” automatic transmission. The Escalade Hybrid’s 0-60 acceleration time is 8.2 seconds. The Environmental Protection Agency rated the Escalade Hybrid’s fuel economy at 20 miles per gallon city, 23 miles per gallon highway, and 21 miles per gallon combined, which beats the traditional gasoline Escalade’s combined rating by five miles per gallon. EPA ratings are the same for both rear-wheel-drive and all-wheel-drive versions. The Escalade Hybrid was sold in base and Platinum trim levels. The base Cadillac Escalade Hybrid comes with 22-inch wheels, a power tailgate, magnetic adaptive suspension, fog lamps, blind spot alert, rear parking sensors, a roof rack, a sunroof, keyless entry, keyless remote ignition, tri-zone climate control, heated and ventilated power leather front seats with memory functions, heated second row leather seats, power pedals, Bluetooth wireless integration, General Motors’ OnStar communications system, navigation, a rearview camera, a touchscreen control system, a rear seat entertainment system, and Bose surround sound audio with satellite radio and iPod and USB connectivity. Standard safety features include stability control, traction control, anti-lock brakes, front side-impact airbags, and side curtain airbags. Trading up to the Platinum trim of the Cadillac Escalade Hybrid also yields a slightly different front end treatment, 22-inch chrome wheels, a leather trimmed dash and door tops, upgraded leather upholstery with contrast stitching, LED headlights, upgraded wood trim and climate controlled cupholders. 2013 is the last model year the Cadillac Escalade Hybrid is available.